The latest addition to the wide choice of Securefast electric locking and access control solutions, the new range of slimline AL900 series Electric Releases offers ANSI style door release and are supplied complete with stainless steel short or long faceplates for use in a wide range of metal and timber door applications. The versatile AL900 electric release is designed to work with all leading brands of deadlocking night latch locks. With a holding force of 1000lbs, when an electrical current is applied to the mechanism the release will either open (Fail Safe) or lock into position (Fail Secure). 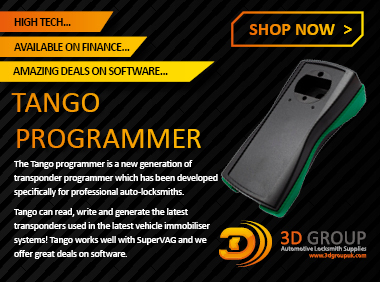 Here at 3D Group we pride ourselves on always looking for the most innovative products to bring to the market. We like to find products that save people time and money but also help to bring convenience too. That's why we are now selling the Mini Condor Electronic Key Cutting Machine and the new Battery Adapter. With 39 years of experience, a 68-year-old locksmith, Wu Kun-hao, opened a century-old safe in 50 minutes after several failed attempts over 3 days by a Japanese safecracker, according to the Taipei Times. The safe dates to Japan's Taisho Period (1912-1926) and the katakana script on the dial is no longer legible. Vanderbilt, a global leader providing state-of-the-art security systems, announced today that it would showcase the latest version of ACT Enterprise at Security Essen 2018. Along with demonstrations of the access control software solution, visitors to Security Essen can explore the full range of products that Vanderbilt has to offer at Stand 6D90, with a significant focus on increased integration within the company's products and with third-party systems. The latest ACT Enterprise features, which include integration with Vanderbilt's award-winning SPC intrusion system, a rules mapping engine, and a smartphone app, were previewed at the IFSEC tradeshow in London in June and received a wave of positive feedback from visitors to the show. Codelocks' CL4520 smart lock combines convenience, flexibility and a powerful mortice lock with a double cylinder. This fresh, new lock is ideal for buildings and environments that experience high traffic or for busy Building Managers seeking to streamline their activities. Presenting the same lever and keypad as the popular CL4510 lock, the CL4520 takes security to the next level. It features a euro profile mortice sash lock with deadbolt and latchbolt safety function. This versatile lock can be set with or without a key-operated deadbolt feature allowing building managers to restrict or allow access by code. Make the most of your ALEX experience and take advantage of the free demonstrations and workshops that are on offer! KAP Diagnostics will be showcasing yet-to-be-released AVDI Abrites key programming software on one of the most popular vehicles in the market today. This will be the first public demonstration! Don't miss out. More details are to be announced soon. Honda CRV 2017 - Key Programming - Key cutting - Remote emulating. Designed for beginners interested in entering the key programming market, the presentation will cover a typical job faced every day by Auto Locksmiths in either a "lost key" or an "additional key" scenario. National security vetting allows individuals access to government information, locations or equipment. In 2017-18, government considered more than 170,000 cases, including applications relating to civil servants, contractors and specialist staff such as those in the armed forces. Before 2017, most national security vetting in the UK was provided by two organisations: Defence Business Services National Security Vetting, and Foreign & Commonwealth Services National Security Vetting. In its 2015 National Security Strategy and Strategic Defence and Security Review, government announced that it would establish a single vetting provider. In January 2017, United Kingdom Security Vetting (UKSV) was created. During 2017, a number of UKSV's customers became concerned that it appeared to be taking longer to vet individuals. A 75-year-old Cleveland man had a harrowing experience last month when his car's electrical system conked out and he was trapped inside for over 13 hours, unaware that he could've freed himself within seconds. Peter Pyros got into the 2006 Cadillac XLR that was parked in his garage on Aug. 31, but found that it was dead when he tried to start it. Instead of a lever, the XLR has an electronic push button door release which didn't work without power. Neither did the windows, roof or horn. TC Security Services, part of TC Facilities Management (TCFM), have not only been placed in the top 2% of all SIA listed companies within the Approved Contractor Scheme in the UK, they have also passed the ISO 9001 and 14001 management systems audits which come in to force next month. The 4-day visit by both auditors involved full scrutiny of the TC Security Services operation and for the ACS audit included visiting both the Head Quarters and satellite offices along with a mix of varied customers. The maximum overall score on the ACS audit that can be achieved is currently 175 points. TC Security Services' score of 164 places them not only in the top 2% of all SIA listed companies within the Approved Contractor Scheme, it also showed an increase in the score awarded by the auditors in 2017. ALEX is now just weeks away - don't forget to register! Even if you've attended previous shows, you need to register again. We know it's a bit of a pain, so to ease that pain we'd like to sweeten the deal a little and offer you the chance to win a shiny new tablet! Keyprint customers had the opportunity to attend their popular Open Weekend on Saturday 8th and Sunday 9th September 2018 at their premises in Edinburgh. "We are delighted to organise our Open Weekend again this year." Company director Nagib Jiwa commented. Access2 will be joining us on stand 14, showing a range of products ideal for auto locksmiths. "Last time we took our latest locks to an expo, the interest was phenomenal. We don't expect things to be any different at this year's ALEX event because VANLOCK and the new TIGRIS Secure Solutions range are superb. Security officials in the UK are concerned that the nation's communications backbone could be at risk thanks to a piece of US-made software that is about to go out-of-date. The software is currently being used by Chinese telecoms giant Huawei, the company responsible for supplying networking equipment for BT, Vodafone and their subsidiaries. The problem surrounds Huawei's use of Wind River Systems' VxWorks operating system. The software will stop receiving security patches and updates in 2020, possibly leaving theWind River Systems' VxWorks operating system open to attack.